In the online business world, everyone these days needs landing pages that look good and perform well, but if you’re starting out and bootstrapping your online entrepreneurial project, it can be hard to create landing pages that convert without buying expensive software or learning how to code. How do I know this? Over the past 11 years, I built and invested in a portfolio of online businesses. I know it can be challenging having to spend $99 a month on a landing page builder when you’re just starting, and you want to save for more important expenses. Thanks to Thrive Architect, I went from pages that sucked to getting compliments for my websites – even if they were still not getting traffic. I will try to be unbiased and will show you both the pros and cons of this landing page builder software. I guess I’m kinda qualified to write a review on Thrive, as I’ve used it in more than ten websites in the past years. I will try to let you understand if it’s the right solution for you right now or not. First of all, who is behind Thrive Architect? 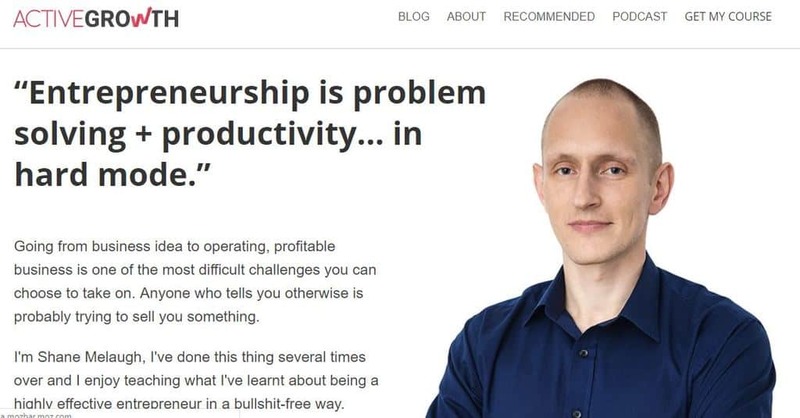 The founder, Shane Melaugh, is a widely accomplished online marketer and entrepreneur that started exactly like many of us: building niche sites and ranking them on Google. After the Panda update, Shane decided to invest in the development of Thrive Content Builder and Thrive Themes, a set of WordPress themes focused on conversions and built explicitly for bloggers. I don’t know Shane personally (yet :)), but I’ve been blown away by the attention to the details and his knowledge about online marketing and entrepreneurship. I tried other landing page builder software built by Internet marketers too in the past, but they mostly lacked that kind of extra effort that makes a software great instead of just a cash-cow. As said before I’ve also been using Thrive Architect for years now (since when it was called in another way), and I’ve been pleased to see the constant updates and improvements made on the software UX, features, and the templates available. 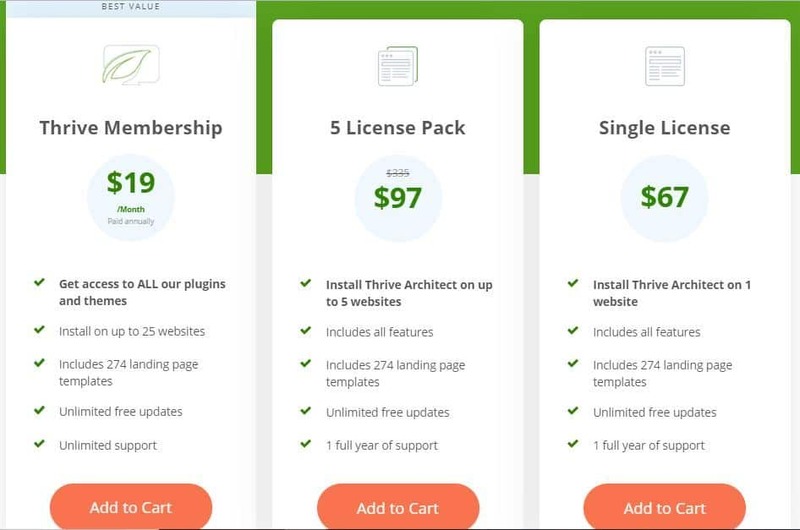 At a $ 67 lifetime per site, Thrive Architect it’s cheaper than any other major landing page builder I’ve found on the Internet. With all the features given, and the chance to build genuinely outstanding landing pages, this makes it already a huge pro if you’re bootstrapping your business or just starting. Especially if you compare this with other solutions such as Clickfunnels or Instapage that starts at $ 99/month. Thrive Architect works on your WordPress, and as it’s not based on the cloud like other more expensive software, how fast it will be on your side, it’s based on your hosting’s capabilities. Feature-wise, as we’re going to see late in this review, it is not to be considered as inferior to more expensive software, but the fact that it isn’t on the cloud will make it slow most of the times and lagging most of the times. Once you’ve installed Thrive Architect, you’ll be able to use about 70 templates ready for you. I’ve been honestly amazed by the quality of these. They’re genuinely able to turn your website from zero to professionally designed in no time and without any designing or technical skills. The templates are ready for all sorts of usage or industry, and they include guidance in its implementation. I haven’t found as many pre-built demos in any other software in the price range of Thrive. Truly a good plus. In 2017 I was working on the campaigns of an eCommerce client. They didn’t have much budget so more expensive solutions like Instapage and Leadpages couldn’t be considered. We decided to opt for Thrive Architect under my suggestion. This means that we had to install WordPress on a separate subdomain, and I understand that for those who are not familiar with it, it can result tedious not to have straight-away a platform where to manage your landing pages. With all the features that the drag-and-drop editor offers, literally ANYONE. Even my grandma could build a good looking and well-performing landing page with little to no effort. What I like it’s that all the features have been built with true real-life applications in mind. For instance, it takes about 3 seconds to get a pricing table that looks good on your landing page. Other features like tables, click-to-tweak, images regulator, lead generation opt-in form will make it easier than ever to create landing pages that convert, even if you’re a beginner. If you decide to use one of the ready-to-use templates to build your landing pages, you’ll have them responsive already with no further work to be done. However, I’ve found that when you want to build a custom landing page from scratch, it’s very tedious and time-consuming to make the pages responsive. That’s something that the Thrive team should definitely work more in the future. Is Thrive Architect Compatible with other themes? I’ve both been using Thrive Architect with the official ThriveThemes WordPress themes and with third-parties themes. Based on my experience on more than ten websites, I’ve found no problem using Thrive Architect with third-party themes, and an outstanding level of compatibility. The team of ThriveThemes has announced about a year ago that they’re working on a revolutionary and high-customizable WordPress theme, that will undoubtedly be perfect to use paired with Architect, but for now, it is just an announcement and there isn’t anything concrete yet. Thrive Architect doesn’t have built-in an A/B testing feature that can be however be implemented at the inexpensive price of $67/lifetime buying Thrive Optimize. I do have Thrive Optimize on this blog, and the plugin works very well for such a price point. The A/B testing feature works smoothly and can easily compete with high-level software. Thrive Architect is a highly-functional landing page builder software that works smoothly, and it’s easy to use. As said before, I use it on most of my websites, and I’m 100% satisfied with the choice. The team is constantly working on new updates, the ready-to-use templates look good and are highly-functional for each industry. The software is rich in features and ready to be deployed for every application. You don’t have a high-budget, you’re bootstrapping your project, or you don’t need to manage a considerable number of landing pages. If you’re starting a side-hustle for instance, you’ll hardly find better software than Thrive Architect. If you already have the budget and can afford to spend at least $99/month, I would definitely go for Clickfunnels which has already all the features of the whole suite of ThriveThemes (which cost $997 or $47/month) built-in and ready to be used. You’ll get a much faster experience with Clickfunnels and fewer headaches and time wasted switching from one software to the other. What has been your experience using Thrive Architect or Thrive Optimize? Comment below!